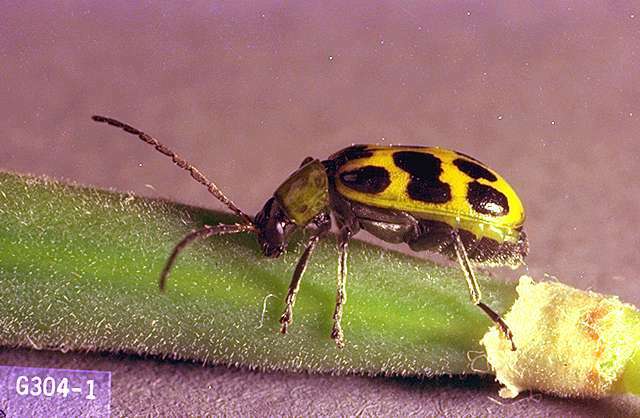 Pest description and crop damage The western spotted cucumber beetle is the primary species of corn rootworm in the Pacific Northwest. It is yellowish green, 0.25 inch long, and has 11 black spots on its wing covers. 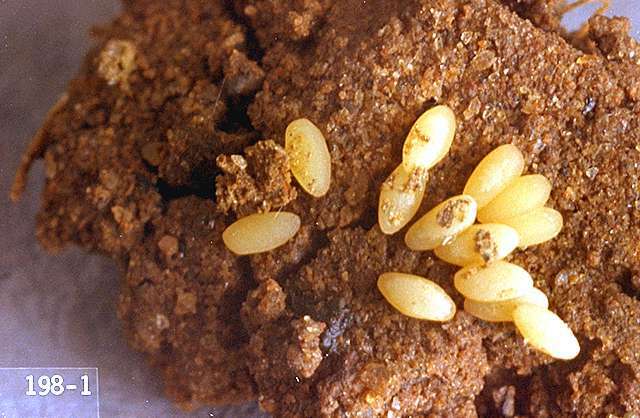 Mature larvae are white except for the head and last abdominal segment, which are brown. They are about 0.62 inch long. 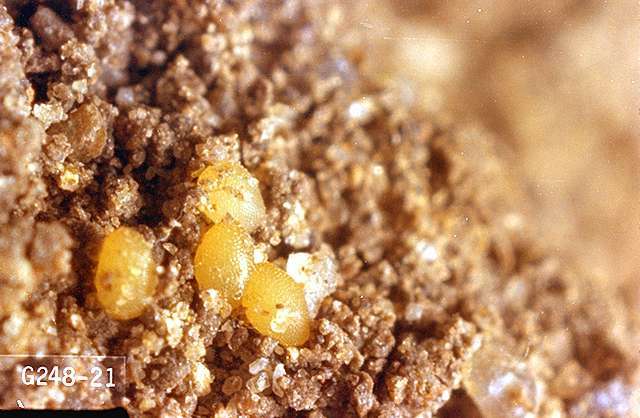 The larvae appear to have two heads. 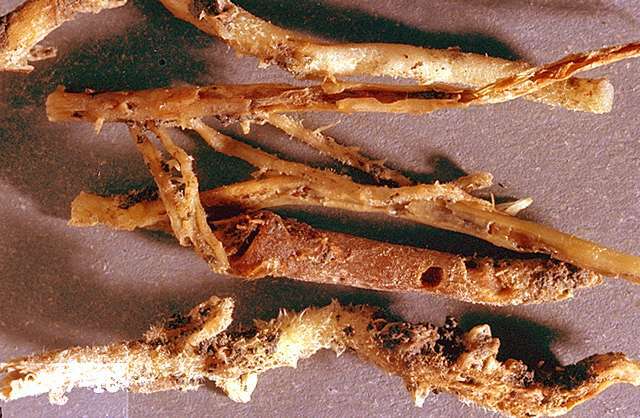 Corn rootworm larvae feed on roots and bore into the base of stems, killing corn seedlings and reducing root mass in mature corn plants. 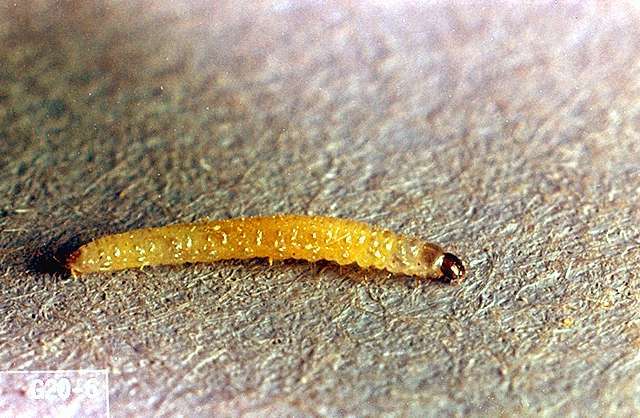 Significant corn rootworm pressure can reduce plant establishment, reduce plant growth (due to root damage), and contribute to lodging of corn plants prior to harvest. 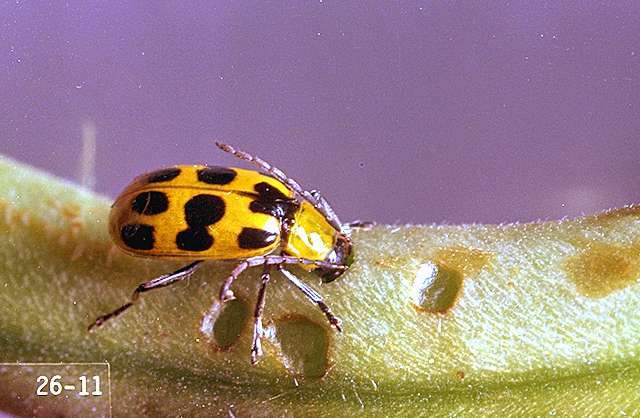 Pest Monitoring No action threshold has been established in Oregon. 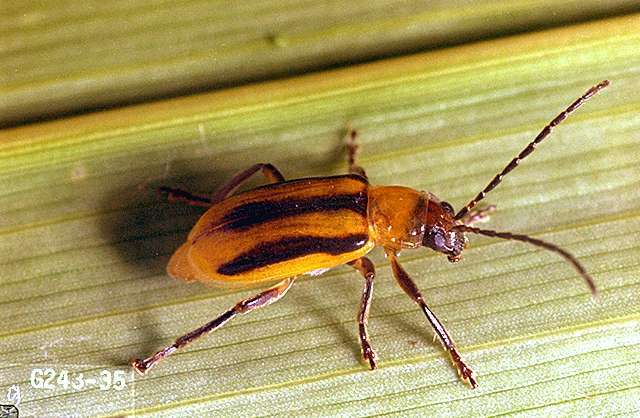 If significant numbers of adult beetles are observed feeding and laying eggs in unprotected sweet corn plantings at emergence, this may justify a postemergence insecticide treatment. 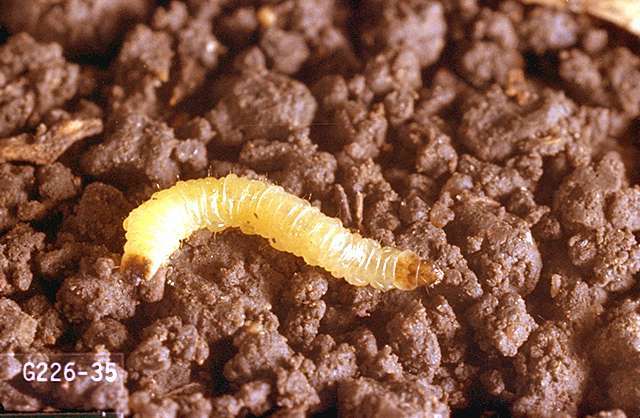 Bacillus amyloliquefaciens (Ethos XB) at 0.08 to 0.2 lb ai/a applied with liquid fertilizer at plant. REI 12 hr. bifenthrin (Capture LFR) at 0.08 to 0.2 lb ai/a banded or over furrow. REI 12 hr. Do not exceed 0.2 lb ai/a per season. bifenthrin/IBA (Empower 2) at 0.002 to 0.006 lb ai/1,000 linear row ft at plant. PHI 30 days. REI 24 hr. Do not exceed 0.1 lb ai/a at plant application. chlorethoxyfos (Smart Choice 5G) at 0.15 to 0.25 oz ai/1,000 row ft. REI 48 hr or 72 hr if annual rainfall is less than 25 inches. chlorpyrifos (Lorsban 4E, Lorsban 15G)-REI 24 hr. Consult label for application details. clothianidin (Poncho 600) at 0.25 to 0.5 mg ai/kernel seed treatment. Not for use in hopper-box, slurry-box, or similar applications. Use in liquid or slurry treaters. ethoprop (Mocap 15G) at 0.063 to 0.125 lb ai/a at plant. Mocap 15G rate depends on row spacing; see label. REI 48 hr or 72 hr if annual rainfall is less than 25 inches. Applied as a band on row or closed seed furrow, or as side-dress from planting to lay-by. Do not contact seed. gamma-cyhalothrin (Declare) at 0.0025 lb ai/1,000 row ft. PHI 21 days. REI 24 hr. Do not exceed 0.024 lb ai/a. Isaria fumosorosea Apopka Strain 97 (PFR-97) at 1 to 2 lb/a of product as soil treatment. REI 4 hr. Retreatment interval 3 to 10 days. OMRI-listed for organic use. lambda-cyhalothrin (Warrior II) at 0.005 lb ai/1,000 ft of row soil treatment. REI 24 hr. Do not harvest for feed or graze livestock for 21 days. Do not exceed 0.48 lb ai/a per season. phorate (Thimet 20G) at 0.056 to 0.075 lb ai/1,000 row ft. PHI (see label). REI (see label). Apply at planting time or cultivation. Do not exceed 1.3 lb ai/a per year. Limit 1 treatment per year. tefluthrin (Force 3G) at 0.008 to 0.009 lb ai/1,000 ft row (0.12 to 0.15 oz ai/1,000 ft row). REI 0 hr. Use either at planting or lay-by. Only one application per year. thiamethoxam/abamectin (Avicta Complete Corn 250)-Seed treatment for certified seed treatment facilities only.